The German fairy tale ‚Lil’ Peter’s Trip to the Moon’ is a novel length story. An important part of the story is the tale of Mr Sumsemann, a violin playing beetle, who lost one of his legs. Without his sixth leg all of his children will be born with five legs. When Mr Sumsemann goes to the moon to search for his leg, he is accompanied by Lil’ Peter and his sister Anneliese. There they find the leg with the help of the man on the moon. In order to return home the man on the moon shoots them all back to earth with his canon. This last scene is depicted in the quilt that has been designed and made by Jolanda and Sabine. It is a walk on the moon seen through children’s eyes. Jolanda has been a successful international artist in painting and photography for many years. 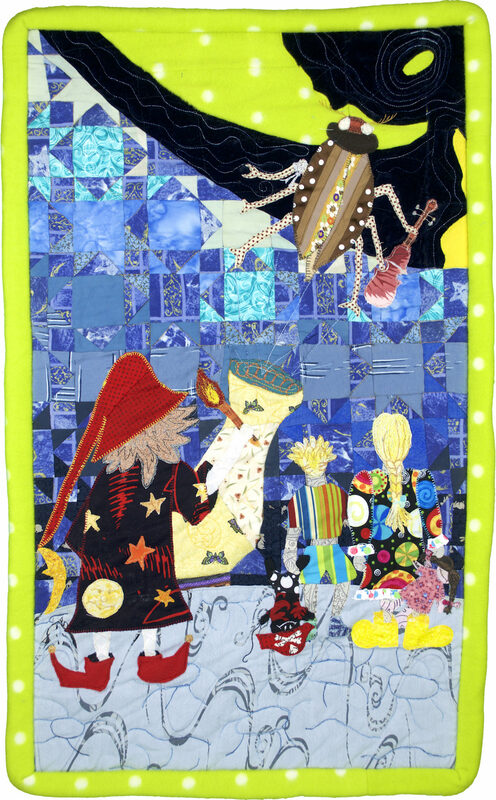 Through a relapse with her MS she turned in 2004 to patchwork and quilting as an outlet for her creative talent. In 2007 Jolanda lost her color sight and in 2010 she opened a patchwork shop in Germany. Jolanda teaches and designs all of her quilts. She makes many unique custom quilts for a variety of purposes for domestic and business clients. Sabine (Samö) is the apprentice of Jolanda. The finer techniques of tiny patchwork, applique techniques, the artistic expression in fiber art and working within the restriction of an assignment were the educational goals for her participation during this challenge. Patchwork, applique, quilting, filigrane applique.